Sicily Is Shaken By Earthquake As Mount Etna Erupts Once Again The volcano erupted two days ago, triggering 1,000 mostly small tremors. At least 10 people were injured and a number of buildings were damaged in Wednesday's quake. 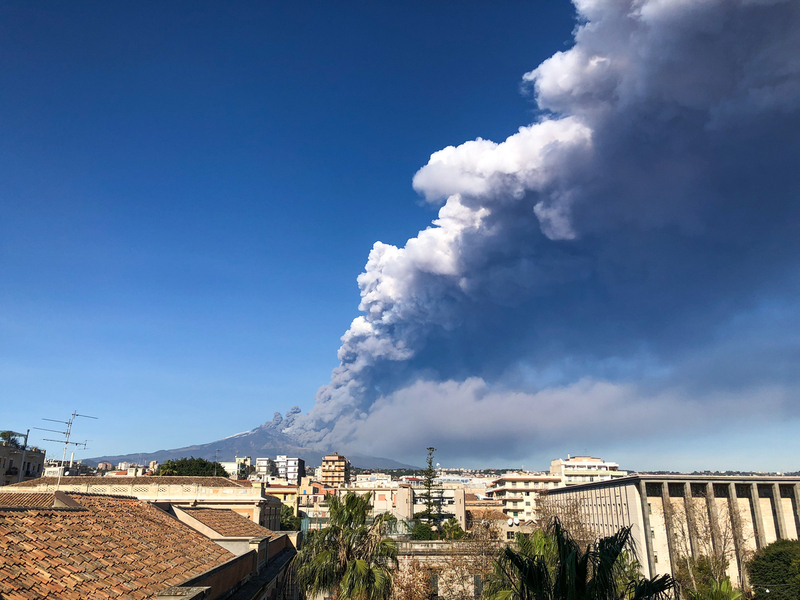 Ash spewing from Mount Etna is seen from the Italian city of Catania on Monday. A 4.8 magnitude earthquake followed, early Wednesday morning. First came the eruption. Then, the quake. An overnight earthquake, triggered by Mount Etna's eruption two days ago, caused injuries and damage in Eastern Sicily early Wednesday morning. The volcano has been spewing ash and lava has flowed down its slopes since it began erupting on Monday. The quake registered 4.8 magnitude, according to Italian news agency ANSA, which reported 600 people were displaced by the temblor. Officials said the quake was one of about 1,000 tremors — most of them small — related to Etna's eruption, The Associated Press reports. 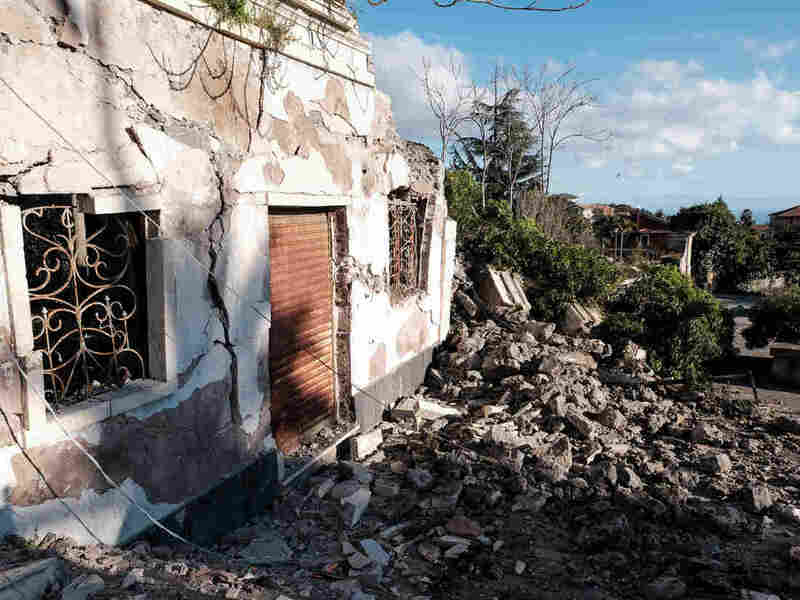 NPR's Sylvia Poggioli reports that Italy's Civil Protection Agency set up temporary shelters for those whose homes were damaged or who were too frightened to go home. At least 10 people were injured, according to the AP, and others sought medical care for panic attacks or shock. A section of a major roadway was closed, as was the railway along the Ionian coast, ANSA reported. Damaged buildings in Zafferana Etnea, Sicily, on Wednesday after a quake shook the area before dawn. Images of the area showed churches and buildings strewn with rubble, fallen signs in front of shops, and toppled statues. On Monday, ANSA reported that a new fracture had opened on Etna's southeast crater, from which ash was spewing. Authorities closed down airspace over the airport in the nearby city of Catania. "Etna remains a dangerous volcano, and this country of ours is unfortunately fragile," government Undersecretary Vito Crimi said Wednesday, according to the AP. Many people reportedly slept in their cars after the quake. 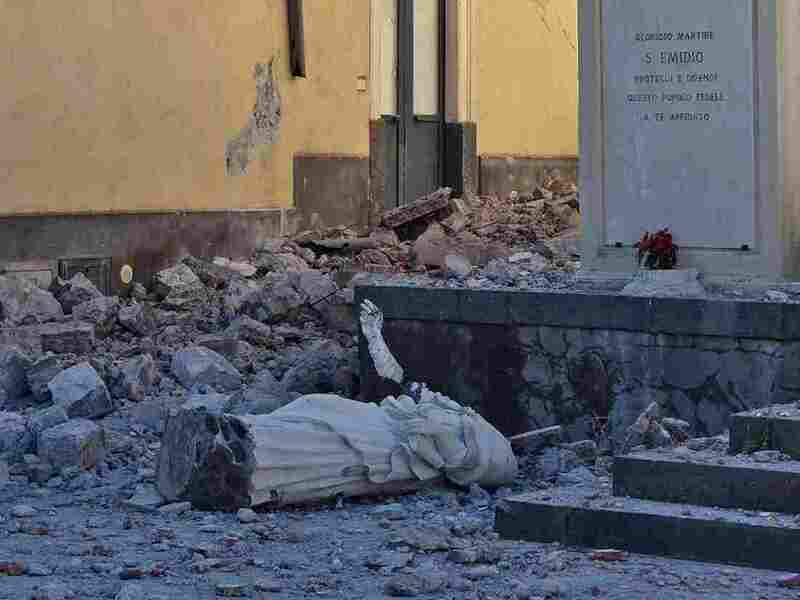 A toppled statue in Pennisi, Italy, on Wednesday. Mount Etna is the most active stratovolcano in the world, according to the United Nations, which has named it a World Heritage Site. Etna has one of the world's longest documented history of eruptions, stretching back to 1,500 B.C. One local resident said the earthquake was worrying. "Tremors during eruptions are pretty normal here," Gaetano Maenza told The Guardian. "What is unusual is the level of magnitude triggered by Etna. I have no memory of such intensity. It was scary." Mount Vesuvius, located near Naples in a heavily populated region of Italy, has also exhibited increased seismic activity recently, according to the newspaper. A previous version of this story classified the earthquake as 4.8 on the Richter scale. That scale, which measures local magnitude, is no longer in general use and has been replaced by one measuring moment magnitude.